Although unofficially designated a surface-to-surface ICM, the Snark was essentially a small, turbojet-powered, unmanned aircraft. It was designed to be fired from a short mobile launcher by means of two solid-fueled rocket boosters. 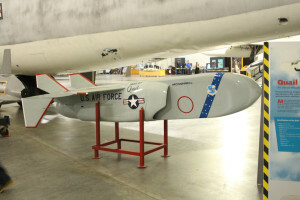 Once airborne, the Snark was powered by a single Pratt and Whitney J-57 turbojet engine capable of cruising at Mach 0.9 to an altitude of approximately 50,000 feet. After a programmed flight of 1,500 to 5,500 nautical miles, the Snark’s airframe separated from its nose cone, and the missile’s nuclear warhead followed a ballistic trajectory to its target. Plans developed by the Strategic Air Command employed the Snark’s against enemy defensive systems, especially radars, to ensure the effective penetration of enemy territory by manned bombers. 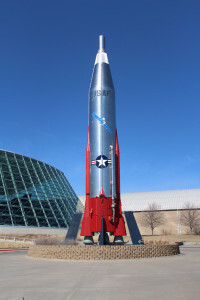 The Convair Division of General Dynamics produced three different models of the Atlas ICBM destined for deployment with the Strategic Air Command. The first operational version of the Atlas, the “D” model, was a one and one-half stage, liquid-fueled, rocket-powered (360,000 pounds of thrust) ICBM equipped with radio-inertial guidance and a nuclear warhead. It was stored horizontally on a “soft” above-ground launcher, unprotected from the effects of nuclear blast, and had an effective range of approximately 6,500 nautical miles. The second Atlas ICBM configuration possessed all-inertial guidance, improved engines, a larger warhead, and was stored in a horizontal position in a “semi-hard” coffin-type launcher. The Atlas F missiles also were deployed in “hard” silo-lift launchers which stored the missiles vertically in underground, blast-protected silos. 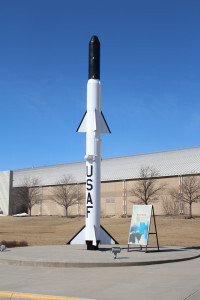 The Thor, developed for the Air Force by Douglas Aircraft was a single-stage, liquid-fueled, rocket-powered (150,000 pounds of thrust) ballistic missile equipped with all-inertial guidance. The Thor was stored horizontally on tactical field-deployed launchers. The missile could be fueled and fired to an effective range of 1,500 nautical miles upon approximately 15 to 20 minutes’ notice. The Quail was an aerial decoy missile carried by SAC B-52 bombers, and when launched could confuse and reduce the effectiveness of enemy surface-to-air radar systems. It would be used during bombing missions to confuse enemy radars by mimicking the exact radar signature, speed, altitude, and maneuvers as actual bombers. 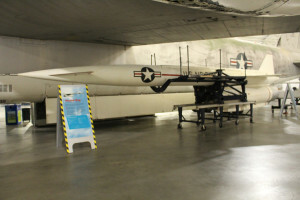 The Hound Dog missile was designed as a long range defense suppression missile to be carried in pairs on the under-wing pylons of B-52 Bombers. 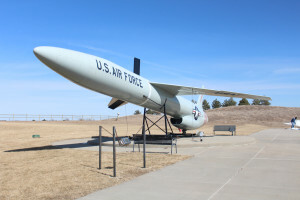 When When launched at high altitude the Hound Dog's 1 megaton warhead could strike a target nearly 500 miles away, having been guided by an inertial guidance system and targeting information supplied by a computer within the B-52. Also, the B-52 could utilize the Hound Dog's jet engines for supplemental thrust during high-weight takeoffs. It was operational with SAC between 1961 and 1976. SCOUT, an acronym for Solid Controlled Orbital Utility Test system, was a four-stage solid fuel system capable of launching a 385-pound satellite into a 500-mile orbit. 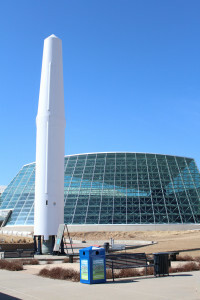 SCOUT was America’s first solid-fuel launch vehicle capable of orbiting a satellite. 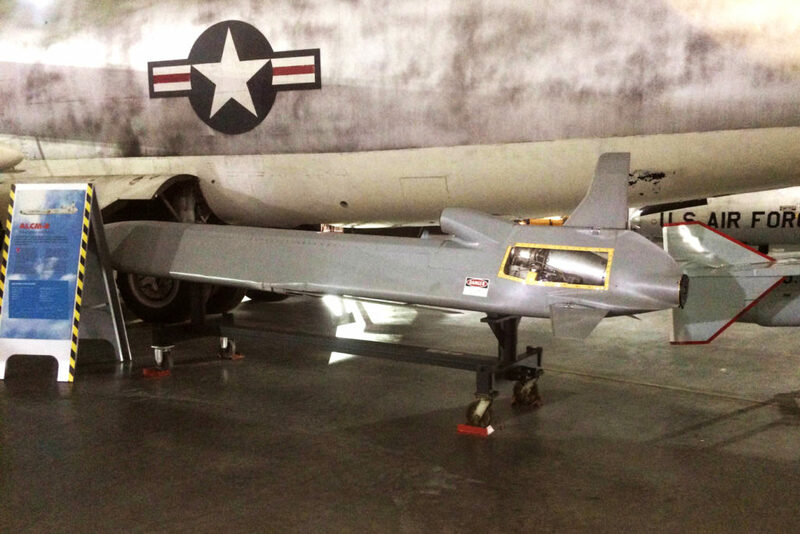 The AGM-86B was developed to increase the effectiveness of B-52 bombers, and was able to fly complicated routes to a target through use of a terrain contour-matching guidance system.